We preferred the picture quality from this HV30 (MiniDV tape) compared to the Sony HDR-S11 (hard drive) camcorder we reviewed last month. Both are similarly priced, and offer a similar range of features. Both can import footage straight into iMovie. The key difference is the formats. MiniDV is a cassette tape format that records using HDV, which offers better bit rate, meaning less image compression and less unwanted artefacting than a hard drive or solid state drive that uses the AVCHD codec. MiniDV tapes are also switchable and more robust than hard drives. We still find the film quality of HDV warmer, less digital looking, than AVCHD. AVCHD will catch up soon, because HDV is limited to 1,440x1,080 resolution, while AVCHD isn't. The HV30 is very easy to use. The menu system is simple and the buttons self-explanatory. It's a chunky camera to hold, and felt less compact than the Sony, mostly because of the bulbous tape case under your palm, but also because of the strap, which is non-breathable, and was sticky on a hot day. The HV30 is so closely based on last year's award-winning HV20 that if we didn't know better we would wonder if anything, except the colour, had changed at all. There are some minor improvements, of course; the zoom toggle is more solid and responsive than before, and the LCD has an improved picture quality, though still on the small side. The interface, processor, menu system, lens, size and shape, grip, power system, export options and other features remain intact. The imaging prowess of the 1/2.7-inch CMOS sensor and DIGIC DV II processor, is superb. This is an old pairing that you can find on the HR10, HV20 and other models stretching back to 2007, and the HD resolution was corrsepondingly identical. Image stabilisation is still excellent, even at full zoom. Still shots are superb too. On a Mac there is no speed benefit for hard drive camcorders. Importing footage from this HV30 was faster than importing from the Sony hard drive model because of the transcoding the AVCHD footage needed. 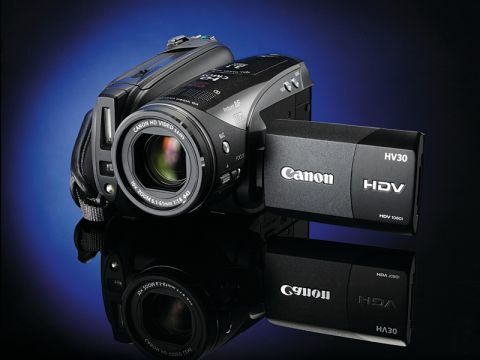 If you want a very good camcorder, then we recommend the Canon HV30. It has a higher quality image than the latest HDD models at the same price. Better still, shop around for last year's HV20. It is considerably discounted now but virtually identical, so you could pick up a bargain.